About 1 hour drives from The Roayal Grand Palace-Bangkok, or from Damnern Saduak floating market, to Samphran District, Nakhon Pathom province, Samphran Elephant Ground & Zoo is a place to visit when travel in Thailand for all age groups. 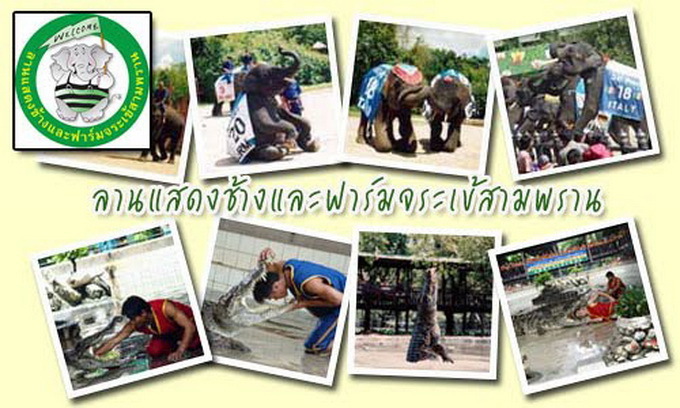 Some highlights include The Elephant Theme Show and The Crocodile Wrestling Show. The Elephant Show has a complete surround sound system with narrations throughout the presentation. The elephants are the featured stars in the show, where they perform dances, play soccer, and fight battles like the “Yutha Hathi.” Yutha Hathi is a great historical royal battle scene which the elephants are utilized during the fight. As for the wresting show, the master crocodile catcher performs breath-taking stunts with the crocodiles that you cannot believe your eyes. Visitors can also check out the tropical garden and waterfalls on the elephant’s back. photos with a twin tiger 'Lift & Oil', or sample Continental cuisine and halal at the Erawan Restaurant. Accredited by CITES as “One of the cleanest and most impressive public displays of crocodiles in the world”, and awardee the 9th Thailand Tourism Award from Tourism Authority of Thailand, surely the visitors will enjoy exploring the zoo ground. Open daily from 08.30 - 17.30 hrs. - The above rates for children apply to those below the heights 130 cm.